Top: Laura Letinsky, #38, Rome from Hardly More Than Ever, digital C-print, 17x23-3/4 in., 2001. Courtesy the artist and Edwynn Houk Gallery, New York. 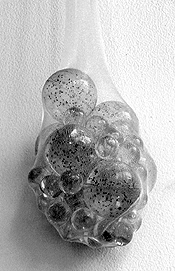 Center: Amy Honchell, detail from Glands and Soft Parts, installation at Zolla/Lieberman Gallery, Chicago, colored tights, glass marbles, 2002. Courtesy the artist. 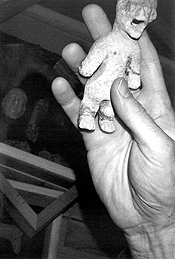 Bottom: Hold everything: an escapee from the collection of Andrew Young. Photo by Julie Farstad, 2004.
cindy loehr get it on!